Invisalign, also known as clear aligner therapy, are an alternative to braces as they are clear retainers to straighten teeth, offered by Dr. Herzog in Richmond Hill at her Oak Ridges dental office. Invisalign is the custom fitted removable tray solution that only needs to be changed every two weeks. Should you desire to expedite this process and cut your treatment time in half, we also offer ACCELEDENT to be used in conjunction with your Invisalign trays. With every tray change, the system progressively straightens, aligns and improves your smile. The best part about the Invisalign system is that they are clear, and virtually unnoticeable to those around you. The only thing people will notice is your new and improved smile! There are other advantages to Invisalign beyond the aesthetic nature of the treatment. For instance the removable clear aligners allow for easier cleaning and oral hygiene practice. Your normal brushing and flossing regimens can be maintained since the trays are removable. 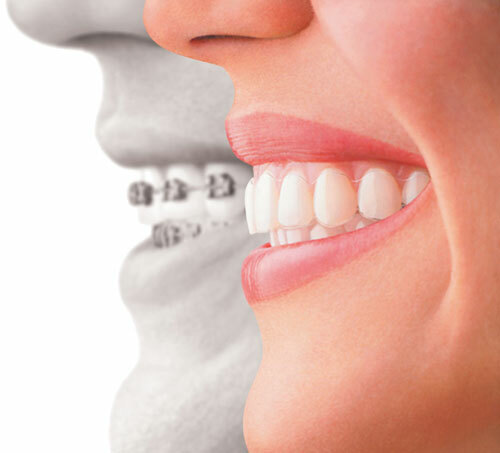 Finally, the irritation that can often occur with metal braces can now be avoided.